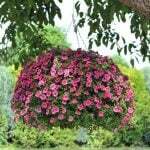 Although most of us probably think of the old fashioned mophead hydrangea (H. macrophylla) first, with those amazing balls of bloom in pink or blue, there are other varieties. 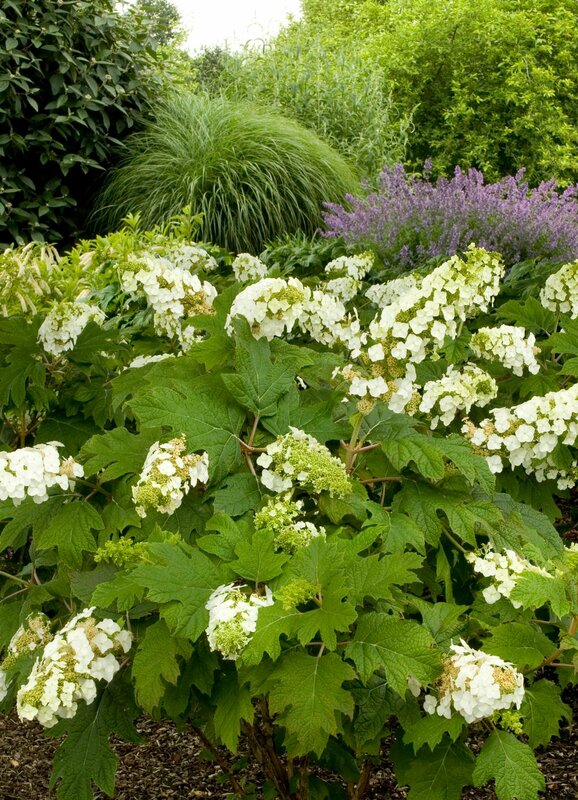 Oakleaf hydrangeas grow well in partial shade, and lace cap hydrangeas have a more delicate flower. There is also the more heat tolerant PeeGee hydrangea, H. paniculata. And if that isn’t enough variety, there are now the new reblooming hydrangeas, like “Endless Summer”. First, basic hydrangea care, then we will look at the different varieties so that you can choose the right one for your garden! How Much Sun Do Hydrangeas Need? Most hydrangeas prefer morning sun and afternoon shade, and don’t deal well with hot climates. Coastal climates are ideal, as are cool summer areas. Both too much heat and too little sun can contribute to poor performance for old fashioned hydrangeas. PeeGee hydrangeas deal much better with heat. Oak leaf hydrangeas are perfect for partial shade areas. 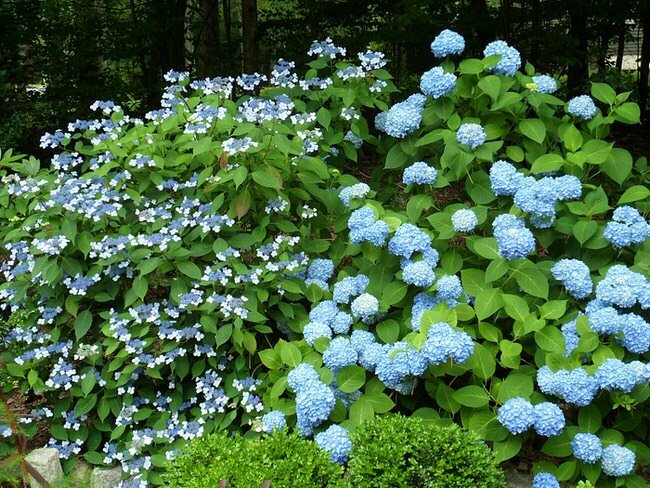 No hydrangea will bloom in deep shade. Hydrangeas prefer to be evenly moist, and love a fertile spoil. That having been said, when using commercial fertilizers, it’s often advised to use half strength liquid fertilizer so you don’t stimulate too much leaf growth at the expense of the flowers. Most (except re-bloomers) bloom on old wood, so severe pruning is not necessary. Prune away dead wood each spring, and dead head the flowers that are past their prime to promote the most flowers on each bush. PeeGee and Annabelle hydrangeas are more tolerant. Hydrangeas prefer soil rich in organic matter. You may have heard that you can change the color of a hydrangeas blooms based on soil composition. It’s true that the pink and blue varieties are influenced by the soil ph. 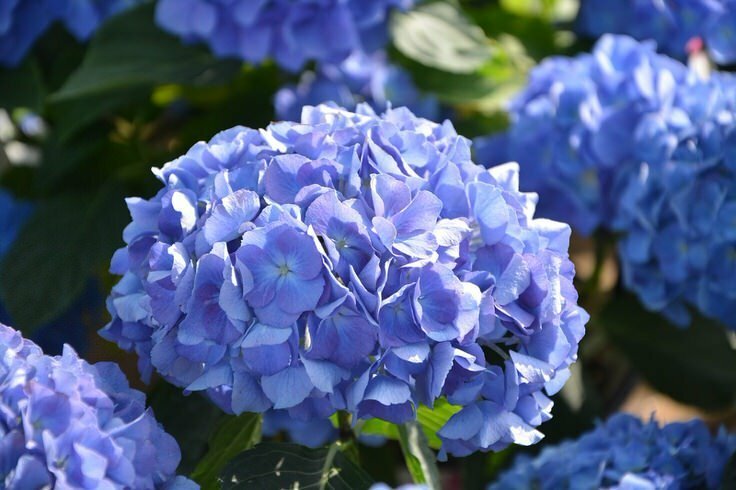 You can change a pink hydrangea to blue by adding aluminum sulfate to the soil to make it more acidic. It is pretty difficult to change a blue hydrangea to pink however. The biggest problems hydrangea gardeners have is lack of bloom. This is usually caused by one of three things- a late freeze, using a variety that is not intended for your climate, or pruning too much of the old wood away. KariAnne of ‘Thistlewood Farms‘ has a mantel full of beautiful blossoms that convince me she’s found the secret to growing hydrangeas and getting them to bloom!! Check out her advice on getting hydrangeas to bloom. 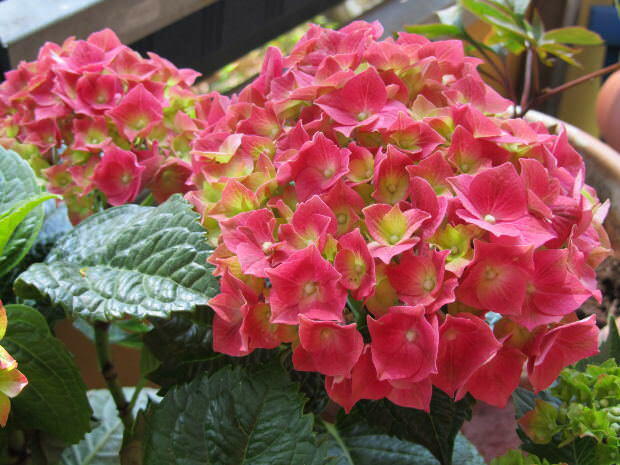 Mophead Hydrangea – Hydrangea macrophylla. 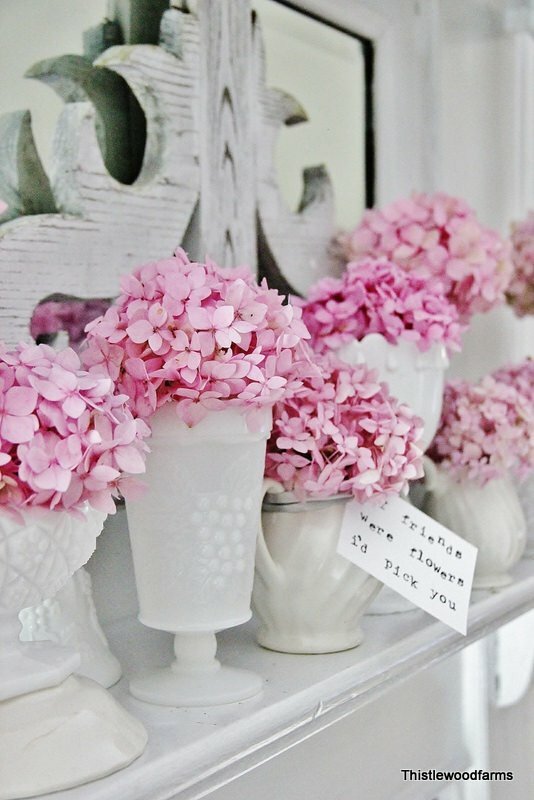 Traditional pink or blue hydrangeas. Hate summer heat. Lacecap Hydrangea – Hydrangea macrophylla normalis. Lacey and more easily naturalized into the average landscape, these shrubs are less formal, but still amazing specimen plants. Oakleaf Hydrangea – H. arborescens. 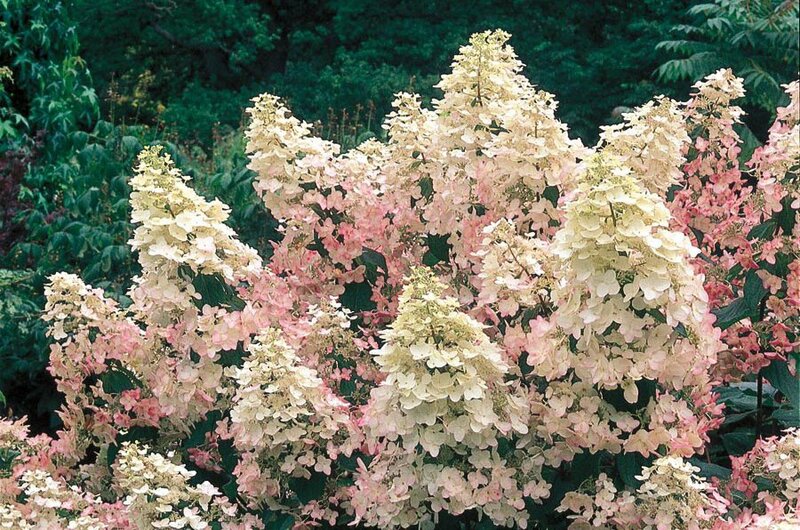 Oakleaf hydrangea had oak shaped leaves that turn lovely purple and red in the fall, and conical shaped white flowers that bloom in summer. 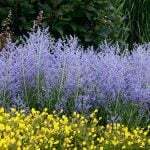 More tolerant to hot summers, tolerant to shade, and tolerant to drier soil. Wonderful garden plant! Photo by ‘Monrovia‘. PeeGee Hydrangea – Hydrangea paniculata. Large conical white to pink blooms, Peegee’s tolerate cold and require several hours of sun a day. 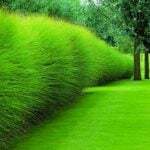 They can grow quite large, and are tolerant to pruning, so can be used as a hedge. Peegee’s also bloom a little later, August and September. They are the only variety that can be pruned into tree form. Photo by ‘Lowes‘. Cold zone hydrangeas – Hydrangea arborescens “Annabelle” is a large white flowering variety that blooms and grows well in cold climate zones. Hardy down to zone 3, these flowers can be up to 10 inches across! Reblooming Hydrangea – Hydrangea macrophylla, the most popular new variety of the reblooming mop head is “Endless Summer”. 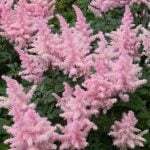 These tend to be smaller shrubs, prefer partial shade, and bloom pink or blue. Reblooming several times over the summer, they are a popular choice for large containers as well. It’s worth a little extra effort to learn about how to grow hydrangeas. They can survive in a garden for generations, and are a beloved flower that every gardener should have the chance to grow. 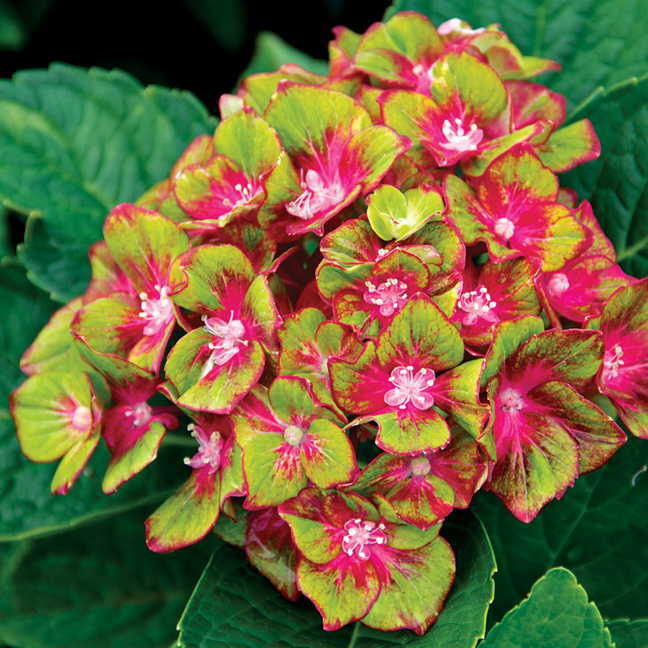 UPDATE: Just ran across this new hydrangea from Wayside Gardens I just had to share… Hydrangea ‘Next Generation Pistachio’ is a compact grower, just 3-5 feet, loves a shady afternoon, and has an amazing lime green petal edged with pink! Zones 5-9. Now that you know all about Growing Hydrangeas, you can jump over to our posts on How to Grow Peonies and 10 No Fail Perennials for Low Water Gardens! 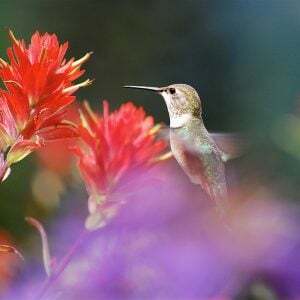 ← How to Attract Hummingbirds: Make a Hummingbird Haven! How to Attract Hummingbirds: Make a Hummingbird Haven! I love hydrandeas and I am determined to grow them! They’ve been my nemesis the last few years. Thank you for the great information! 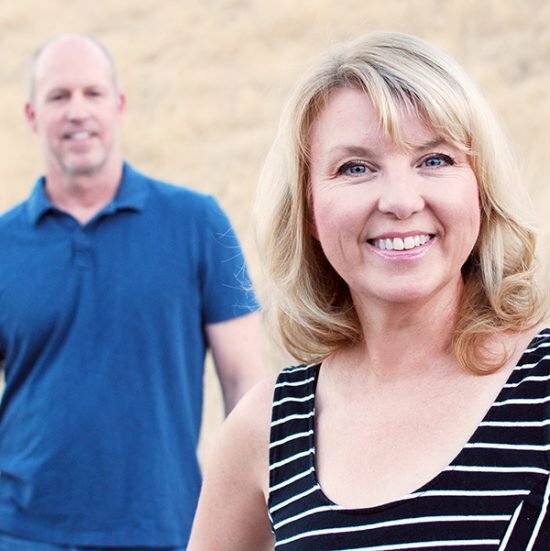 If you click on the “p” on the right side just under Steves and my picture, you will go to our Pinterest account where you can “follow” us, which means you will be flooring the blog. If you want to follow just this post, pin any of the photos and it will always bring you back to that post. Hope that helps! I would go for it! Wisely, you know that it WILL need afternoon shade in your area, either one should do well! Let us know how they do! I have a dark blue endless summer hydrangea, and live in North Alabama. Ever year it blooms very well, but then a month after it blooms the leaves start to get black spots on them and begin to shrivel up and die. We have tried spraying milk, and anti-fungal that the local Lowe’s suggested but nothing has worked! Any thoughts of what this could be? Thank you in advance for your help. 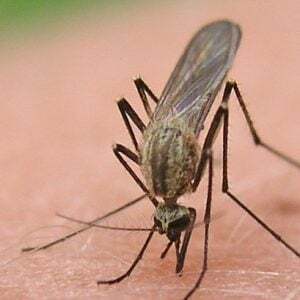 Well we are no experts in Southern gardens, but it sure sounds like a fungus of some kind… Perhaps start spraying the anti fungal early in the season, and spray every 2 weeks all season long so the fungal spores never get a chance to do damage? Sometimes the best place to get help for things like that is your local nursery… NOT a home improvement store… The nursery staff has more specific knowledge about plants. Good luck, we love hydrangeas! I have a city line rio hydrangea that is at least 5 yrs old but has never bloomed. Canary one tell me why. I have a climbing Hydrangea for five years. It has full sun and good soil. It has never bloomed! My friend has one with beautiful blooms every year. Can you help. We did a quick little bit of research, and it seems like they usually take a bout 5 years to start blooming, so hopefully you are almost there! We have also heard epsom salts can help, and making sure you are not pruning off any lateral branches… Hope this helps! I might consider Oak Leaf Hydrangea, they are pretty tough and can take some shade… Hope that helps! Hi Kathy, my grandmother has a beautiful hydrangea in her yard that I would love to have a piece of to start in my yard. What is the best procedure for this.? My mother in law sent me hydrangeas for my daughters second Birthday, it was on July 11th of this year, I potted it in planter with Miraco grow soil and I water it twice a day, it gets morning sun and afternoon shade, but it look like it is dying, It is very very hot in Hope Mills NC ….. I can bring it in side, is there anything that you recommend that I do ? Should I water it more, I am not fantastic with plants , but I do try , and it was so wonderful when had got it. I’m trying to put a garden together with my little girl , of plants and flowers that can live with Horrible Hot weather !! if you have any ideas please let me know ! Hydrangeas hate to dry out, and sometimes in really hot weather we need to water planters several times a day… If it is dry a couple inches below the surface, it needs water, no matter when you last watered it… We are having a really hot summer too, hang in there! Butterfly Bush is a shrub that flowers that tolerates the heat better…. Just one suggestion… Any readers in the South have suggestions? How do you root hydranga cuttings? Did your Hydrangea get at least 4-6 hours of sun every day? I planted a pink hydrangea about a month ago and all the leaves are turning brown on the edges. I don’t know what I did wrong… they did get quite a bit of rain right after I planted them. It has not been below the upper 40s so I don’t think the cold got them. Any ideas what to do?? Thanks in advance! I have an old blue flowering hydrangea shrub in my back garden. It used to have the most beautiful blue flowers but this year the flowers were a bit fading in colour. I would like some advice on how to.move this plant, as at the moment its on the ground and I would love to move it into a big pot and griw it there. Any tips please? I live in Washington State and planted my first hydrangea, which is doing great. What do I need to do to winterize this plant? We normally get snow and can have several days of below zero temps. I would mulch 2-3 inches deep, but keep the mulch a couple inches away from the base, so that it can breathe and you don’t harbor disease/insects close to the trunk… Are you west side? We are east side, they don’t do as well here unfortunately, or I’d have a whole row! I planted two hydrangea plants this spring. They each a quart size. However, They were rooted cuttings not in soil, given to me from a friend. I live in micHigan (zone 5) and planted them after the May 15th as recommended for our zone. They have not grown at ALL. The leaves look like crap (not dead though) I have them on the east facing side of the house, I water them during dry spats and put coffee grounds around them every day. I only have two possible guesses of what could be wrong: my soil is pure sand or the cuttings still need more time to establish roots. Any advice would be much appreciated! Christine, I’ve done the blue for sometime. MAKE SURE the soil ph is correct. If you have to add any additive to get ph where you want it, I always doubled the dose and makes for really brilliant blues. Just be careful not to prune away too much of the bark at years end. It makes for slow bloomers the following year.